The continuum of images in Asif’s last post attests to the emergence of a distinct visual vocabulary of space flight long before it became a reality. It is not coincidental that the first of these images is from Yakov Protazanov’s Aelita, a 1924 film that enthralled moviegoers but left official critics scratching their head. In “Imagining the Cosmos,” Asif situated the film’s ideological complexity as well as its striking visuals within an astonishingly diverse network of early-twentieth-century cosmic enthusiasm. Here I would like to think about a different set of relations between cinema and the cosmos, based not so much on modes of representation but rather on the fundamental convergences between the process of making movies and the “co-production of imagination and engineering” long before space flight became a reality. The interface between engineering and imagination underlying the very apparatus and materiality of the cinematic medium — which becomes particularly visible in special effects — links the history of Soviet space culture with the spectacular pre-histories of its future projected on the big screen. The remarkable phenomenon of Soviet cinema that I am tempted to call “astrofuturism” consists of a considerable body of science fiction films representing space flight that subsequently became integral parts of the national and transnational circuits of space culture. 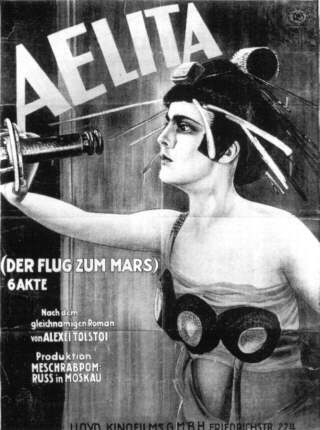 Starting with Aelita, in the three decades between 1924 and 1957 a number of Soviet films ventured beyond the Earth, enabling the audience to inhabit the cosmos in the immersive environment of the movie theater. Two of these films — Aelita and Vasily Zhuravlev’s Cosmic Voyage, made in the expanded Mosfilm studios between 1930 and 1936 — stand out for the ways in which they mobilize, and indeed inscribe on the very surface of the screen, an unprecedented conjuncture between technology and vision, engineering and imagination. What is Aelita looking through? A telescope, a movie camera, or an instrument representing both? This question is seldom asked in all the discussions about how Protazanov visualized rocketships and Martians. His audience, though, may have been more perceptive to the Martian princess’ instrument of imagining Moscow, and zooming in on the earthly object of her desire, than we might think. Between 1899 and 1901, popular science magazines in Russia exploded with the news of a new kind of “cosmic theater” whose environment was completely different than that of a planetarium. As the award-winning science reporter V. A Bitner of Nature and People (Priroda i liudi) put it, the Uranie in Berlin — whose replica Uraniia would soon be erected in St Petersburg — projected closely synchronized telescopic images of outer space on the screen in such a way that “completely sucked in” the audience, “putting them literally on the surface of Mars, Venus, or the Moon.” Sitting in the Russian Uranus Theater, the journalist described himself “transformed into a creature from outer space” by the experience of “witnessing the fantastic spectacle of a solar eclipse not from the Earth but from the Moon” (1). The double estrangement of the cosmic theater allows us to make sense of Aelita’s peculiar two-way traffic in cosmic voyeurism. One of the first things a viewer notices is that the film privileges not the terrestrial scientist’s view of Mars but rather the perspective of the princess, looking through an instrument at what the critic Andrew Horton, following Ian Christie’s pioneering terminology, calls the “domestic drama” of the NEP era. The opening scenes of the movie, in fact, visualize the marvelous new relationship the cosmic theater established between science and spectators. What the princess sees — and what catalyzes the narrative itself — is documentary footage of contemporaneous Moscow and its teeming spaces of everyday life, zooming in finally on a close-up shot of Los kissing his beloved on the river. Simultaneously, the chamber housing the prized telescope on Mars is also revealed to be a movie theater — the space in which engineering and the imagination catapults earthlings and Martians together into the cosmos. Soviet scientists and engineers of the 1950’s were fascinated by the extraordinary versimilitude of Vasily Zhuravlev’s Cosmic Voyage (2). Indeed, what continues to amaze today’s science fiction buffs is the startling accuracy with which the movie predicted the details of the laboratory, the hangar, the engines of the spaceship, the interior, the illumination, the spacesuits, and even the surface of the moon. It was not so much the extraordinary resources at Zhuravlev’s disposal but the unique combination of his advisors that made Cosmic Voyage, according to some critics, the first “real” science fiction film about space travel (3). Embedded within the imaginative signature of the master filmmaker Sergei Eisenstein, who constantly challenged the young director’s own knowledge about outer space, was the scientific vision of the legendary Konstantin Tsiolkovsky, who not only reviewed all the drafts of the script but also contributed his own sketches, models, and mathematical formulas (4). Conversely for Tsiolkovsky, who died four months before the release of Cosmic Voyage, “the film by the talented young Mosfilm director V. N. Zhuravlev” provided the perfect symbiotic ground for testing out the truth of his own futuristic engineering (5). 1. Anindita Banerjee, We Modern People: Science Fiction and the Making of Russian Modernity (Wesleyan University Press, 2013), 53. 2. Vasily Zhuravlev, “Za chetvert’ veka do kosmicheskoi ery,” Iz istorii kino: Dokumenty i materialy (Moscow: Iskusstvo, 1985), 122-46. 3. Mikhail Dolgopolov, “Zhiul’ Verny sovetskogo kino: Nauchno-fantasticheskii fil’m Kosmicheskii reis,” Komsomol’skaia pravda 24 May 1934. 4. Vasily Zhuravlev, “Kak sozdalsia fil’m Kosmicheskii reis,” Znanie-sila 11a, 1954. 5. K. E. Tsiolkovsky, “Tol’ko li fantaziia?” Genii sredi liudei (Moscow: Mysl’, 2002), 120-21. This entry was posted in Russian Space History, Soviet and Russian Space Flight. Bookmark the permalink. Also, apropos the general conversation, it might be worth bringing up a couple of sources on cosmic enthusiasm outside the Soviet Union and in the postwar period. There’s Patrick McCray’s recent book ‘The Visioneers: How a Group of Elite Scientists Pursued Space Colonies, Nanotechnologies, and a Limitless Future’ (Princeton University Press, 2012) and De Witt Kilgore’s ‘Astrofuturism: Science, Race, and Visions of Utopia in Space’ (University of Pennsylvania Press, 2003). Thank you, Asif, for the sources. I’m just now delving into Zhuravlev’s film and it’s been a fascinating experience from the perspective of both techno-scientific and media studies. Astrofuturism is a fascinating concept that I believe needs much more culturally situated analysis to really see the interplay between transnational or global visions and its communitarian, national, or regional iterations. Both Geppert and Kilgore’s study (which consciously plays on the assonance between Afro- and astro-futurism) are important steps in this direction.